Most Realtor friends of mine have a philosophy of not being involved in politics and never even discussing them. That is a good plan if you are a mushroom. Not so good for anyone involved with their community. I am not talking about partisan politics; I am speaking about helping to push for needed law changes to better your community. You can get involved through your Board of Realtors or State Associations legislative committees. The last two years I joined Realtors to lobby the legislature and City Council for needed law changes. It didn't take much time. It was time well spent. I recognize not every one is up for doing that. There are other ways you can contribute. Send in written testimony and write letters to your area law makers. Community support of needed laws changes is required for them to have a chance. This year in Hawaii we are working to make a law requiring scrap metal dealers to register who they buy their metal from and serial numbers etc. wherever possible. We want them to also make records available to the State Attorney General's office. Currently in Hawaii we have a problem with criminals vandalizing buildings, bridges, etc. for the cooper or aluminum. In the last couple of months two of the homes my office had for sale have the copper plumbing cut off under the home. This caused extensive damage and a large expenses to the home owners. We have seen them take copper wiring, causing street lights along the highway to be disabled and they have even stolen aluminum railing off bridges, creating huge safety issues. 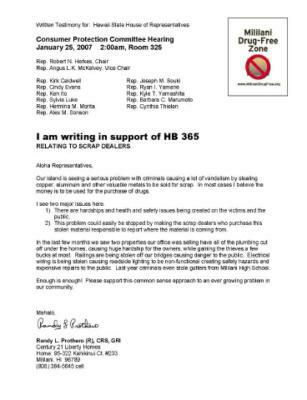 State Rep. Marilyn has taken up our cause and introduced House Bill 365 to address this problem. It will be heard tomorrow, January 25, 2007 at 2:00pm in the House CPC Committee. Rep. Lee and I belong to different political parties. That does not stop us from working on issues that will better our community. This is a great example of how being politically active and helping your community does not need to be a partisan issue. David - If we want laws changed we need to push them. I attended the Mililani Neighborhood Board tonight and spoke in support of that scrap metal bill. I also picked up a possible listing from one of the board members. True. We all have myriad time commitments-but it doesn't take much to write a letter or an email to those in power so they know what's on the minds of the constituency. If you don't communicate with them to get the problem addressed, who are you leaving in charge? Leigh - I dose not take much time at all. Otherwise you are leaving politiicans to decide what is important for you. Randy, if people in the Real Estate Industry do not speak up and make there feelings know, then they do not grounds to complain about laws that are past that they do not like. To me not being involved is like not voting and then complaining about the clown that got elected. Not voting is to me the same thing as voting for the clown, and not speaking up is like approving the laws that we do not like. If you want change you have to create it. This Post is a great call for action Randy, keep it up. George - I was a little frustrated today when I found I was the only one to send written testimony to my State Reps office on the bill our community group asked her to introduce. We truely get the government we deserve. You know that I have run the Realtor (T) political race. I was damn good at it too. 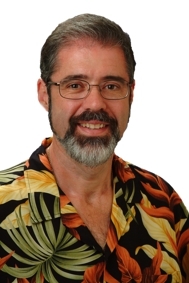 I helped to change our MLS system and I helped change the overall attitude of our local BOR. With that said I am featuring this post in The Out Of The Box Group. With any luck at all maybe a few Professionals will "get it" and quit their freaking whining and step up to bat. If everyone just keeps whining from the sidelines nothing is going to change. So, folks, if you are in this business get involved with the politics. This Industry needs our help. If not you, then who? Way to go Randy! You see something wrong and you're not afraid to take the effort to attempt to change it. We need more people like you around this country! TLW - I had a feeling you were not a sideline person. Lysa - Nothing changes unless we get involved. Wow. Stealing copper is common in the 3rd world, but I didn't know it occurs in the US as well. One of my professors in college had a saying, "Politics Is A Good Thing". I hope others will get involved in issues that affect their communities. Tchaka - If the community does not stay involved we will not like where we end up.